NASA's Kepler mission has discovered multiple transiting planets orbiting two suns for the first time. The system, known as a circumbinary planetary system, is 4,900 light-years from Earth in the constellation Cygnus. 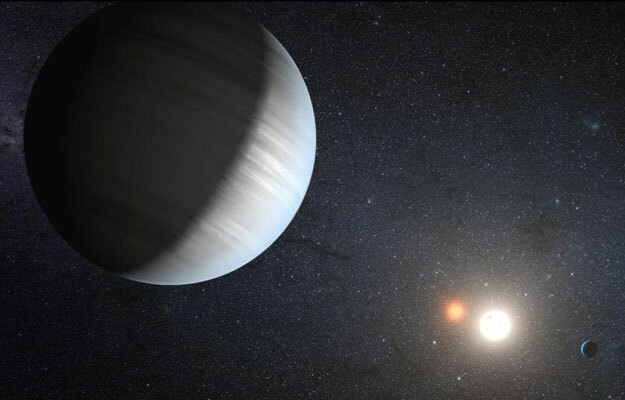 Coming less than a year after the announcement of the first circumbinary planet, Kepler-16b, this discovery proves that more than one planet can form and persist in the stressful realm of a binary star. The discovery demonstrates the diversity of planetary systems in our galaxy. "In contrast to a single planet orbiting a single star, the planet in a circumbinary system must transit a 'moving target.' As a consequence, time intervals between the transits and their durations can vary substantially, sometimes short, other times long," said Jerome Orosz, associate professor of astronomy at San Diego State University and lead author of the paper. "The intervals were the telltale sign these planets are in circumbinary orbits." The outer planet, Kepler-47c, orbits its host pair every 303 days, placing it in the so-called "habitable zone," the region in a planetary system where liquid water might exist on the surface of a planet. While not a world hospitable for life, Kepler-47c is thought to be a gaseous giant slightly larger than Neptune, where an atmosphere of thick bright water-vapor clouds might exist. "Unlike our sun, many stars are part of multiple-star systems where two or more stars orbit one another. The question always has been -- do they have planets and planetary systems? This Kepler discovery proves that they do," said William Borucki, Kepler mission principal investigator at NASA's Ames Research Center in Moffett Field, Calif. "In our search for habitable planets, we have found more opportunities for life to exist." 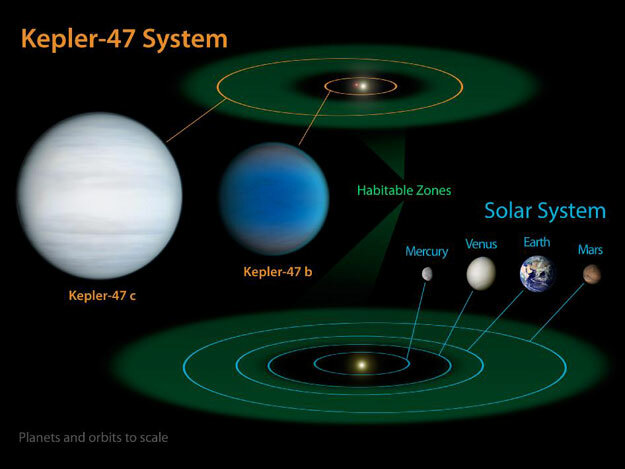 "The presence of a full-fledged circumbinary planetary system orbiting Kepler-47 is an amazing discovery," said Greg Laughlin, professor of Astrophysics and Planetary Science at the University of California in Santa Cruz. "These planets are very difficult to form using the currently accepted paradigm, and I believe that theorists, myself included, will be going back to the drawing board to try to improve our understanding of how planets are assembled in dusty circumbinary disks." Ames manages Kepler's ground system development, mission operations and science data analysis. NASA's Jet Propulsion Laboratory in Pasadena, Calif., managed the Kepler mission development. The Space Telescope Science Institute in Baltimore archives, hosts and distributes Kepler science data. Kepler is NASA's tenth Discovery Mission and funded by NASA's Science Mission Directorate at the agency's headquarters in Washington.